I just moved into a house that has 2 water heaters. The second one was rarely/never used by previous owner and all the hot water that comes from it is smelly. This came up during the inspections but the inspector said it's because the traps of the drain dried out so now we're smelling sewer gases. That idea was a bunch of sewer gas, but I digress. Other relevant information is that the hot water heater in question is relatively new being part of an addition from less than 10 years ago. All that work was permitted. The house is on municipal water, not a well. I've already turned the temperature setting way up and let water run for a little while which seemed to help a little but it didn't solve the problem and the next time the water comes on it's back to the smell we started with. Getting back to the point, I've read in a few places about changing the anode but also about putting hydrogen peroxide in the hot water heater tank. I've found guides/videos on flushing the tank. Unfortunately, I can't find anything about how to get the hydrogen peroxide in the hot water tank. Surely they don't mean to cut into the cold water intake and then repatch that up later, do they? To add anything to the water heater you will need to turn the water off and drain the pressure in the lines. After this there are 2 choices; Pull the anode probably the best idea because it may have dissolved. The 2nd choice would be to pull the supply line and add there. I have never had this problem that flushing and replacing the anode did not fix. After this purging the air out and checking for leaks when the water is turned on. Just a note if a tap in the house is turned on with both hot and cold water while the system is open water may come out as the cold pressure flows back through the hot line. Had this happen when I left a system open while going to the store to get a new anode, what a mess. 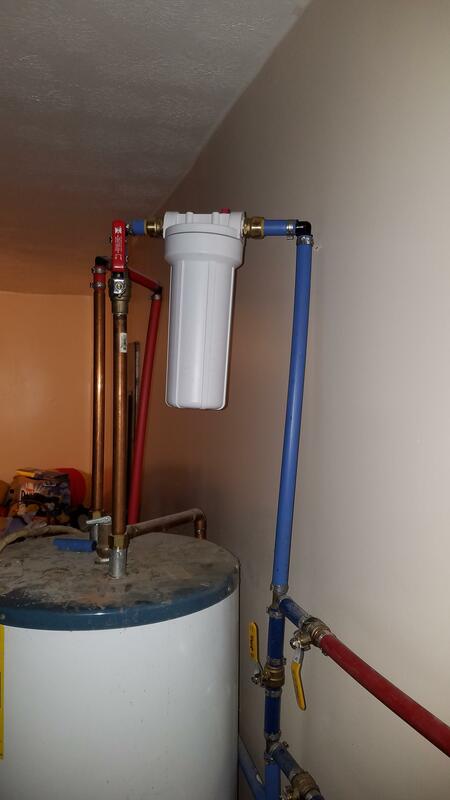 I installed a basic sediment filter on the inlet of my water heater with 2 shark bite 3/4" connectors. I don't have an actual filter in it, but all I need to do is shut the water off to the hot water tank (before the filter), open the hot water at the faucet to relieve pressure, unscrew the bottom of the filter, dump out water and add a bottle of hydrogen peroxide, screw the filter bottom back on. Turn water back on to the water heater and run the faucet hot for a few minutes to get peroxide into heater. Let sit 1 - 2 hrs. Walla! Once a month should do the trick. Not the answer you're looking for? Browse other questions tagged plumbing water-heater or ask your own question. Is corrosion on top to an otherwise working electric water heater dangerous? How to chlorinate a tankless water heater? How are sacrificial anodes electrically bonded to the water heater?